The younger and healthier you are, the easier it is to get life insurance at lower rates. If your income is important to supporting dependents, planning for your future, sending your children to college, paying the mortgage or other recurring bills – life insurance is worth talking about. We can help in a heartbeat! Like most parents, you want to be sure your kids are well taken care of, have opportunities for growth and can afford a quality college education. For this reason, life insurance is absolutely essential while your children are still at home. The average cost of a funeral and burial can easily run into tens of thousands of dollars. With proper life insurance your spouse, parents, or children won’t need to suffer financially upon natural or accidental death. A life insurance policy pays a tax-free cash benefit to your beneficiaries upon your death. In situations where two parents working, or one parent is a stay at home mom or dad – income replacement may be an immediate necessity. If you have young children you may also need to hire help for domestic tasks and childcare. In addition to providing income to cover everyday living expenses, your family may need life insurance to cover debts like a mortgage so they won’t have to sell the house to remain financially stable. Some estate taxes can be steep, so having insurance in place avoids jeopardizing assets or funds that are earmarked for the retirement of your significant other, or bequests left to loved ones. 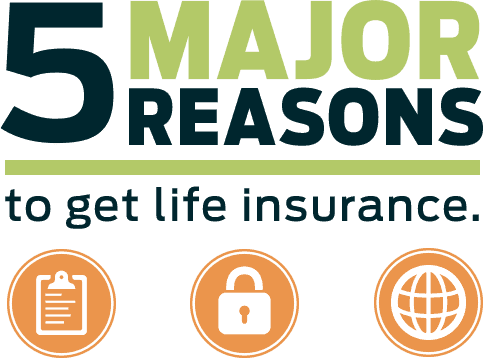 Life insurance provides you with coverage options and choices that add up to greater control over your mortgage protection. See how individually owned life insurance provides you with more options, choices, and control when compared to mortgage insurance offered by your bank or lender. Mortgage insurance only covers your declining mortgage balance. The premium you pay stays the same, but the benefit amount decreases with the balance of your mortgage. You can’t name a beneficiary; the benefit amount is automatically paid to the financial institution. Premiums are often the same amount for smokers and non-smokers. If you take your mortgage to another lender, you may lose your existing mortgage insurance and have to re-qualify for new coverage. You can choose a life insurance amount that can cover more than just your mortgage. You may choose to have the premium you pay stay the same while your benefit amount does not decrease over time. Your premiums are based on your health. If you lead a healthy lifestyle, your premiums may be considerably lower. If you take your mortgage to another lender, your existing life insurance goes with you so you won’t have to re-qualify.